The Walt Disney World Resort is 47 square miles, which is about the same size of San Francisco. A resort this size is pretty certain to have whatever you might be looking for. For those as addicted to caffeine as I am, my first question in the morning is, “Where’s the coffee?” With this mind, here is my quick and dirty “top ten” guide on where to find coffee at Disney World. Now, this list isn’t all-inclusive, and it isn’t even ranked (who can really say one Starbucks is better than another), but I will give you a list of ten options for you to keep in mind when you’re on your “Where’s Waldo?” search for a tasty cup of Joe. Starbucks – West Side Downtown Disney: Nestled next to the Characters in Flight balloon launch in Downtown Disney’s West Side, this coffee mecca is pretty easy to find. And the curse/blessing of any chain restaurant is that you know exactly what you’re getting when you order your favorite beverage here. Starbucks regulars can even use their Starbucks gift cards here. 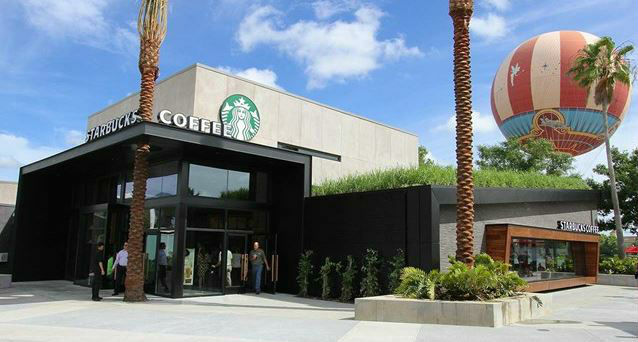 What makes this location unique from any other location is the impeccable coffee theming. True to Disney form, you are immersed in coffee culture, so take some time to peruse the walls and learn a bit about this addictive little bean we all love so much. Once you’ve grabbed your beverage, snag a window seat to watch shoppers stroll along or the Characters in Flight balloon lift-off. Or sip while you doodle on the interactive screen. Kona Café – The Polynesian Village Resort: Kona Café has become quite popular for the infamous Tonga Toast (a delectable French Toast creation that you simply must try, if you haven’t yet). But perhaps not quite so well known is the availability of a carafe of Kona coffee. Grown in the rich, volcanic soil of the Hawaiian islands, Kona coffee beans are renowned for the smooth, rich flavor. Kona Café is one of the few places on the main land where you can enjoy this rare deliciousness. To avoid the throngs of people rushing to Kona Café for the Tonga Toast, I suggest hitting this little spot at night. Take the monorail from the Magic Kingdom and savor a carafe as the perfect ending to a magical day. World Showcase Refreshment Port – Epcot: Right at the entrance to World Showcase, this little kiosk packs a caffeinated punch. Offering a limited coffee options, the addition of the snacking phenomenon of the cronut has increased the popularity of this little spot. And if your coffee needs an extra kick, have them add some Godiva liqueur. Writer’s Stop in Hollywood Studios is a great place to cuddle up with a warm cup of coffee. 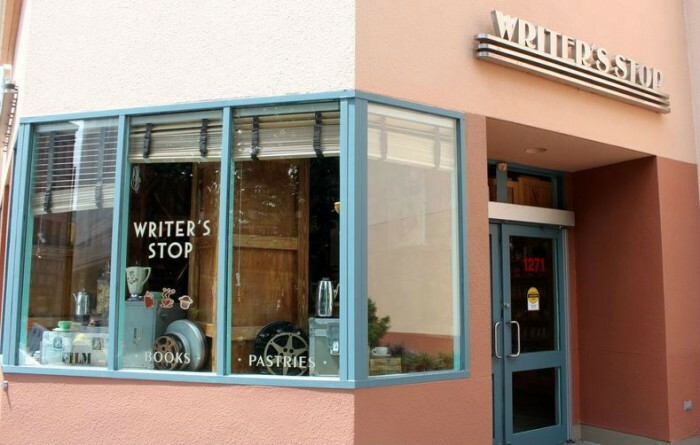 Writer’s Stop – Disney’s Hollywood Studios: Looking for your comfy bookstore coffee shop? 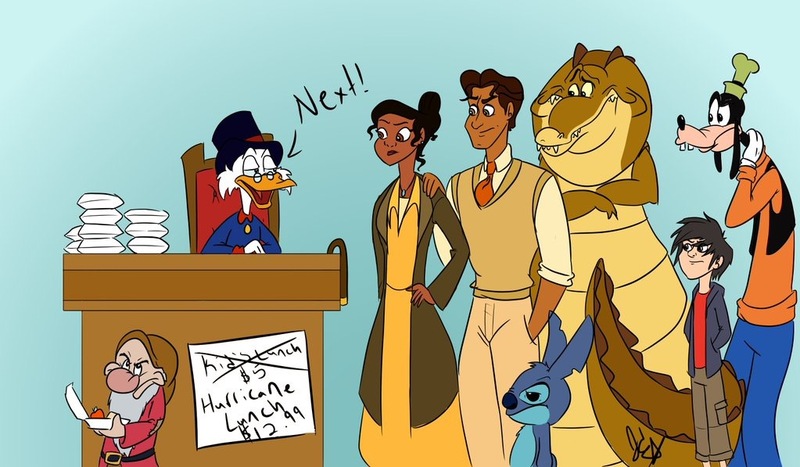 Well, Disney has that, too. Writer’s Stop is a bit off the beaten path at Hollywood Studios, parked close to the Sci-Fi Dine In. Not only home to some favorite coffee and espresso drinks, this little shop also hosts a wide selection of baked good, including the cult favorite, carrot cake cookie. Grab a cup of Joe, a sweet treat, and grab a book and a cozy chair and you’ll quickly forget your in a theme park! Starring Rolls – Disney’s Hollywood Studios: Not to be outdone by Writer’s Stop, Starring Rolls has its own selection of coffee favorites and bakery legends. Enjoy umbrella-covered patio seating at this little haven right next to Hollywood Brown Derby. Their menu of options changes seasonally, but one things that’s always on the menu is a good cup of coffee and the famous Butterfinger cupcake. Main Street Bakery – Magic Kingdom: Now home to new Starbucks location, this place has really started buzzing. Main Street has always been prime real estate, but when you add in the luring scent of freshly brewed coffee, it’s a magnet for every java-holic that walks by. 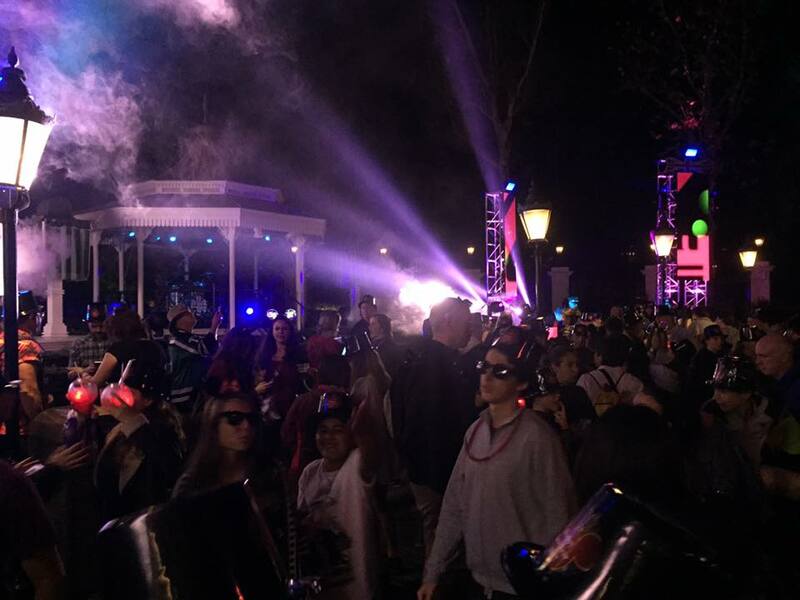 Plus, it’s a perfect place to get that extra jolt during the fireworks to take advantage of those late night park hours. After your safari in Harambe, stop at Kusafari for a quick cup of coffee. 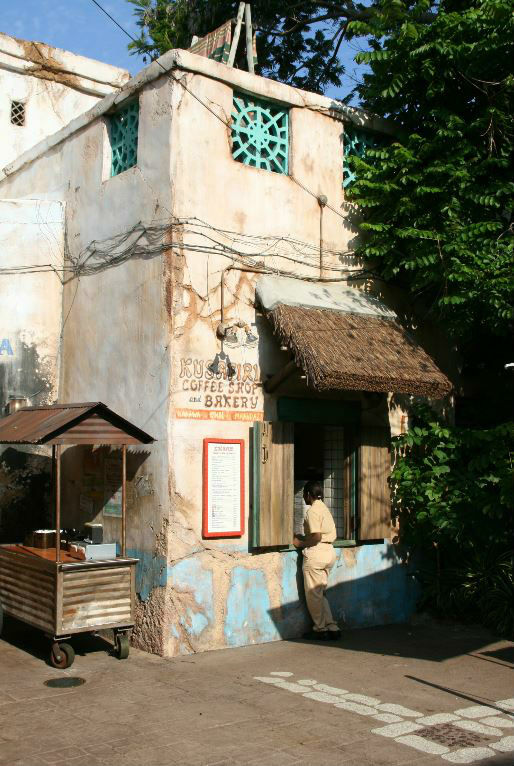 Kusafari Coffee Shop – Disney’s Animal Kingdom: After a long safari in Harambe, even the most intrepid traveler could use a refreshing cup of coffee. Kusafari is off the beaten path in Harambe, nestled next to the Kilimanjaro Safaris attraction. This little shop isn’t fancy, but what it lacks in décor, it makes up for with quaint details. Be sure to stop here and grab an Elephant Ear pastry or a White Chocolate Elephant cupcake, if you can find one, before your next safari. Contemporary Grounds – Contemporary Resort: Conveniently located in the Contemporary Resort lobby, this coffee haven is just a short walk away from the Magic Kingdom entrance. It’s got all of your favorite beverages from the Main Street Bakery, but without the line. This little reprieve could be just what you need as a mid-afternoon power-up with still time for quick walk back to catch the 3:00pm parade. Boardwalk Bakery – Boardwalk Inn & Villas: This retreat is just steps from the hotel’s main lobby and a short boat ride from Disney’s Hollywood Studios and Epcot’s World Showcase. The coffee options here are pretty standard, but the turn-of-the-century ambiance coupled with a sweet treat from their bakery case, makes this stop worthwhile. And a stroll along the Boardwalk, coffee in hand, during Illuminations is a pretty special experience. Fountain View Café – Epcot: The third spot to find Starbucks, in addition to Downtown Disney and the Magic Kingdom. Here you can grab your Starbucks favorite after your glide on Soarin’ and before you head to World Showcase. This location offers your standard Starbucks fare, but with much better than the standard atmosphere. If you’re feeling particularly leisurely, stake out a spot outside and enjoy the nearby Fountain of Nations. As I mentioned, this is not an exhaustive list, but it should help you find a good cup of coffee no matter where you’re at in the World. Have you visited all of these great coffee spots? Which are your favorite places to find good coffee at Walt Disney World? Which ones would you add to the list? Let us know your thoughts in the comments below! This reminds me of a story from when I took my girlfriend on her first trip to WDW. We had staked out a spot to watch Illuminations, near Canada if I remember right. It started to get pretty cold so she asked me where she could get a warm cup of coffee. I had her stay to keep our spot and kept checking kiosks for hot coffee and couldn’t find any. Finally, in Morocco I went into the restaurant to get one. I came back MUCH later with the drink for her. To this day I love to boast that I walked “halfway around the world” for coffee for her. We’ll be celebrating our 10th anniversary this fall. At the Boardwalk, don’t bother with coffee from the bakery or The Fountain….it’s very mediocre. Kouzzina, Il Mulino, and Captain’s Grill offer great press pot coffee. Thanks for recommendations, Keith! I’ve never had coffee at Il Mulino, I’ll have to check it out! I was at DHS last fall and went to the Writer’s Stop for a cup of coffee on my way into the Osbourne Lights. A visitor from Italy was bemusedly asking the baristas to pull another shot of espresso for him (he showed me the first one they pulled and it was oddly watery for espresso). He then proceeded to commiserate with me about the lack of decent coffee in the park. I warned him to avoid the concentrate + hot water “coffee” that dominates the park, and asked him what the Italian word for “sewage” was. Well said, Thanks for sharing this article. This place seems very interesting and enjoyable. I never went there but after reading this blog I am thinking to go Walt Disney World with my family. I really hope that I will enjoy very much over there.